Last night the House of Representatives passed an amendment to the House version of the Fiscal Year 2012 state budget that would change the way healthcare plans for municipal and school employees are developed. 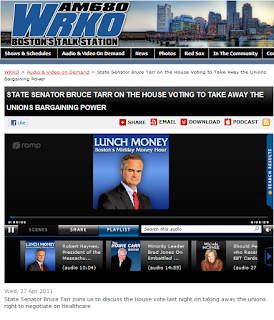 Today I had the opportunity to discuss my initial thoughts on the issue with host Barry Armstrong of WRKO radio's program "Lunch Money". To listen to today's discussion please click the photo posted below. To read the actual language of the amendment please click here.